Kama Sutra Oils of Love Gift Set - Warm, tingling Kama Sutra love oils your lover can taste! 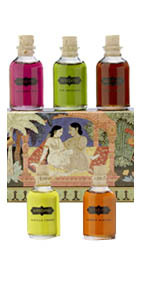 Kama Sutra Oils of Love Gift Set KS0008 - Kissable, silky-smooth, water-based oils that gently warm the skin. Caressed wherever the mood inspires you, our magical oils impart a delicate scent, warming glow, and luscious flavor for every kiss. Playfully challenge your lover to name every one of these five distinctive flavors - using all of their senses. Blow gently to release the oils warming sensations. Use these on your way to becoming the perfect lover. Latex safe, dermatologist tested, hypoallergenic, stain-free. Use externally. Kama Sutra Oils of Love Gift Set Contains: 75 Oz. each of Oil of Love: The Original, Chocolate Mint, Cherry Almond, Raspberry Kiss, and Vanilla Creme.